The Glaciated Region in northeastern Kansas was invaded by at least two of the eight or nine glaciers that ground their way down into the northern United States during the Pleistocene Epoch, between 2.6 million and 11,700 years ago. The first ice sheet to make it to Kansas covered just the far northeastern corner of the state before retreating. The second one, up to 500 feet thick in places, reached farther into the state about 600,000 years ago. It extended west almost to Manhattan and at least slightly south of Topeka and Lawrence along a line roughly parallel to the present-day Kansas River. When the ice melted, thick deposits of sediment—silt, pebbles, and boulders—called glacial drift were left behind. In some places, rich soils good for farming formed from the silt, which is called loess. 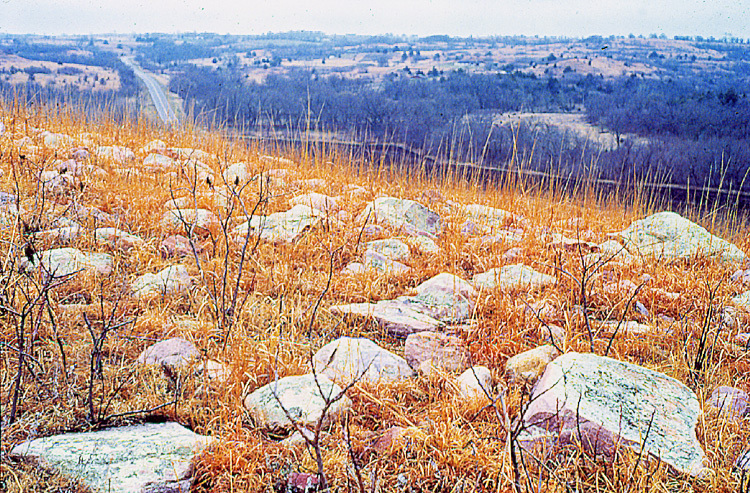 Large quartzite boulders broken off from outcrops about 400 miles to the north in the vicinity the intersection of South Dakota, Iowa, and Minnesota and carried south can still be seen littering a few hillsides in Kansas. The large chunks of the reddish rock, known as Sioux quartzite, stand out in fields of native grassland and have occasionally been used as building material. Pennsylvanian and Permian limestones and shales that dip gently to the west and northwest underlie the glacial drift and are exposed in places where the drift has eroded away. 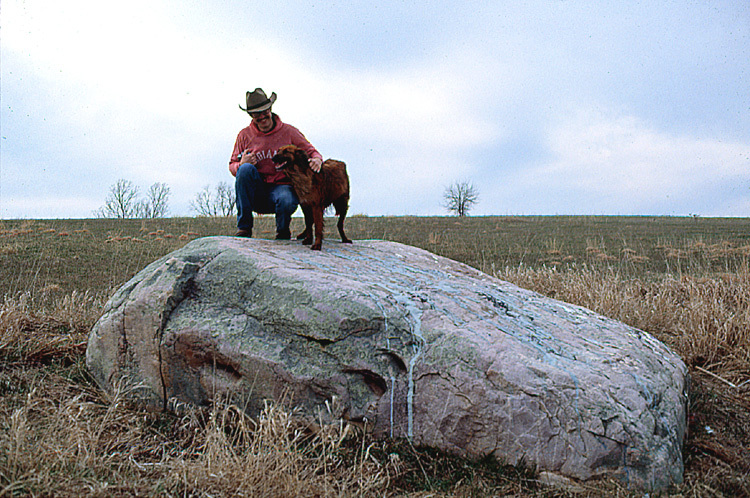 A large number of Sioux quartzite boulders can be seen on a hillside in Waubaunsee County. The site is along Kansas Highway 99 about halfway between Interstate 70 to the south and Wamego to the north. Sioux quartzite also can be seen along a hiking trail at Mount Mitchell Heritage Park about half a mile east of the hillside on an unpaved road. Good examples of vertical walls of loess containing fossil snails can be seen in road cuts around White Cloud in northern Doniphan County. Except for the glacial drift, most of the evidence of glaciation has been erased from the Kansas landscape by erosion. In other parts of North America, such as Wisconsin, the glaciation was more recent and the landscape still bears the marks of the advancing and retreating ice sheet. Buchanan, R., and McCauley, J. R., 2010, Roadside Kansas: A Traveler's Guide to its Geology and Landmarks: Lawrence, Kansas, University Press of Kansas, 392 p.